The Reykjavik Bar Summit earlier this year gave a 'kind of' masterclass on the Whiskey Sour. Pairs of bartenders from W50BB bars Attaboy, Employees Only, Door 74 and Candelaria were all in attendance but probably did not expect to make their Whiskey Sours with one arm each, while encased in an XL t-shirt. The drinks were disgusting but we can tell you that, safely ensconced in their bars, an order of a Whiskey Sour is likely to work out better. It is lemon and whisky. Get those ingredients right and you’re almost there. Victor Jules Bergeron – aka Trader Vic – was the man who, alongside Don the Beachcomber, made fruity drinks cool. When Trader Vic’s brand of Polynesian restaurants globally proliferated, so did the Mai Tai, which can now be found in bars across the world – who knows, maybe even in Polynesia. Tiki got biffed to the sidelines when the Probation-era heavies burst back into the world’s bars, but of late we have seen a revival. Artesian is tiki-esque, Three Dots and a Dash and Smuggler’s Cove are true tiki and Honi Honi, which took part in our poll but finished just south of the top 50, is tikier than a rum-drenched Hawaiian shirt hanging off an arched coconut palm. It’s a bit like when your mother starts playing your favourite record. The Mojito is now the cocktail of the indiscriminate masses and, ergo, kryptoniteto any self-respecting bartender. 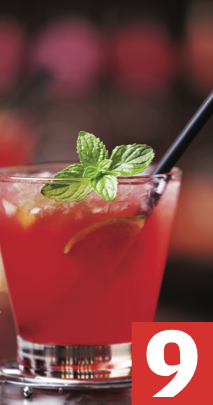 But underneath it all, most still love a Mojito – they just don’t want to make them. There remains no better use for a spare bunch of mint - though Juleps are nice. At The World’s 50 Best Bars Havana Club and Bacardi are the first choices for spirit but that depends whether you want a rum from Cuba or born in Cuba. Enough politics. Whatever the white rum, it should be of Cuban style, the greenery is best in spearmint form and the sugar dissolved, rather than granules that lurk like nefarious aphids among the mint leaves. But that’s just us. Ask a Mexican to make you a Margarita and they’ll most likely make you a pizza. This is an all-American drink that has no kinship to the country which produces tequila, its key ingredient. Magaritas also involve fresh lime juice and triple sec, but many ingenious commercial expeditors have reduced this cocktail to a pre- mixed powder – though not yet ashes. At The World’s 50 Best Bars freshly made Margaritas are the number one tequila cocktail. Here they like it to contain Ocho, Don Julio or Tapatio. The daiquiri is the most ordered rum drink at The World’s 50 Best Bars, yet practically nobody says it right. It’s dy-key-ree, not dak-er-ree. In Cuba, they can say it, and there is no better place to empty the glass of this refreshing sour than under the Caribbean’s warming sun. To make: take strawberries. Throw them at the customer who ordered a strawberry daiquiri. Then take lime juice, white rum and sugar syrup. Shake, serve and repeat. There is no such thing as Daiquiri in the singular: they slip down like a newt on a luge. If Ernest Hemmingway is about, he will want six. 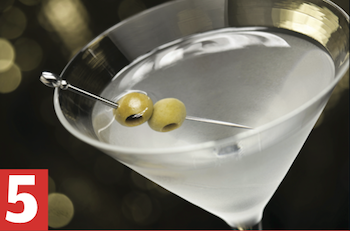 They say you can judge a bar by the way it makes a Dry Martini. This is an unfair test because everyone likes their Martini different. There are those who require a few meagre drops of vermouth, for some it’s a ratio of 5:1 gin to vermouth and there are sensible souls who go with 2 or 3:1. The straight laced don’t drink Dry Martinis. But, however served, this is a drink that put the roar into the 1920s and probably the manes on lions. It is the staple of any bar and requires a gin that can stand up to the scrutiny. At the W50BB they use Tanqueray, Plymouth and Beefeater most. Manhattan is the sweet queen of cocktails with an embittered spirit. At the World’s 50 Best Bars, this perfect match of peppery rye, bitters and sweet vermouth is most likely made with Rittenhouse, Bulleit, or Willet. The classic of unknown descent (though likely New York) is a best seller in half the bars we polled. But only one bar said it was their top seller – it seems it will always be subservient to the king of classics, the Old Fashioned. The Sazerac has been knocking people off bar stools for 150 years. Purists use cognac as the principal spirit and so did bartenders in the 1850s, until phylloxera ravaged French vineyards and the American Civil War made the sourcing of cognac not the most important thing on Americans’ minds. It was replaced by whiskey and to this day some prefer the double booze hit to be propelled by the grain not the grape. Rimmed with absinthe, a hearty sniff tells you this is not a session beverage. More than half the bars we polled said the Sazerac was among their best sellers. If love for the Old Fashioned has passed over the counter from bartender to customer, the Negroni is now appreciated on either side of the divide. This is the quintessential three-ingredient gin cocktail. Count Negroni had the first, but count the Negronis made at The World’s 50 Best Bars and you’ll see why it is second on our list. Best made with 1/3 Campari, 1/3 gin and 1/3 sweet vermouth stirred with ice, most bartenders could make this with their eyes closed – so could consumers, but don’t tell them that, it’ll be bad for business. “The Old Fashioned is the new Mojito” seems to be the line among bartenders. A few years ago this was the darling drink of the community as bartenders fastidiously dribbled bitters on to sugar cubes and stirred whisky and ice like tantric booze-Buddhists. These days they might groan for different reasons – 65 of our 73 polled bars said the Old Fashioned is one of the 10 most likely classics they make. Creatives are not known to enjoy repetition, but this vanguard drink of the classic cocktail revival can be approached in different ways and will likely be a fixture at the top of this list for years to come. Bartenders said Woodford Reserve, Maker’s Mark and Buffalo Trace made the best Old Fashioneds.